Chinese pineapple cakes (鳳梨酥, pronounced Feng Li Su) are a famous pastry in Taiwan. 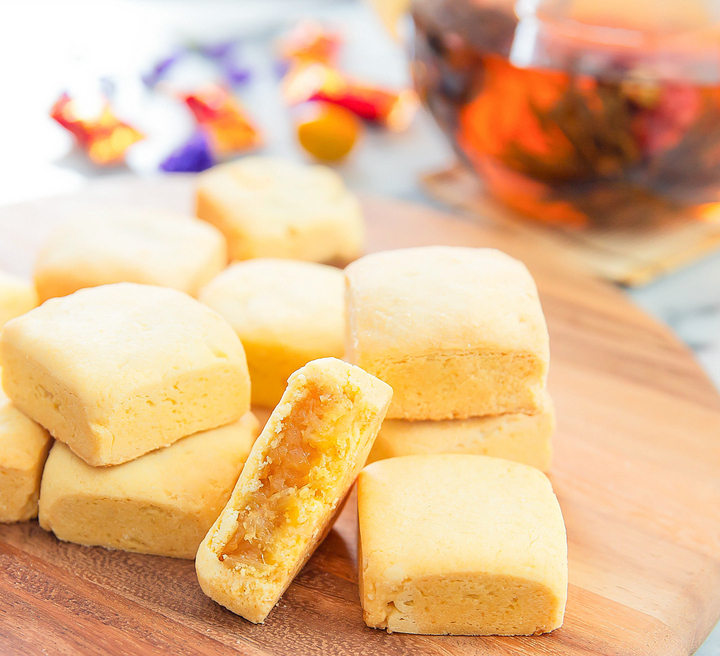 Usually square-shaped, it has a buttery, shortbread-like casing with a pineapple filling similar to a very thick jam. 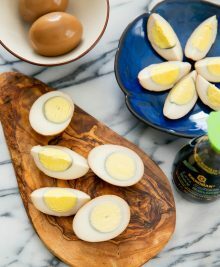 It is often served and gifted around Lunar New Year and for years I’ve been wanting to attempt to make my own. A lot of research went into perfecting these treats. Wasted hours, failed trials, curse words, vows to never make them again all occurred these last several days. But the end result was wonderful. I could barely contain my excitement when this batch was done and bit into one before it had even cooled. There really is nothing quite as satisfying as eating something you made yourself, especially when you finally got it right. This post includes very detailed step by step photos and instructions so that hopefully you won’t go through the same frustrations I did. When I visit Taiwan, I always bring home pineapple cakes. You can find them at every bakery, but not every place makes a good version. In fact, most versions I’ve had are quite poor, especially the offerings in the US. My favorite brand, if you’re ever visiting Taiwan, is Chia Te. People line up everyday at their bakery to buy these treats. Pineapple cakes are also surprisingly pricey, usually more than $1 each for these small, two-bite tarts. The key is the exterior. It needs to be buttery, soft, yet also malleable and sturdy enough to hold its form. Most versions I’ve had are extremely pale, too dry, too soft, or too hard. Year 1. I found a few pineapple cake recipes and they didn’t seem that difficult. I announced I would make them for Lunar New Year. I then went to my local Asian grocery stores in search of pre-made pineapple jam filling which all the recipes called for, but could not find any. Year 2. I vowed again to make my own pineapple cakes, even if it meant I would have to make the jam myself. I bought myself a few cans of pineapples and found a recipe for the filling. The cans of pineapples sat in my pantry for several months past New Year’s and I eventually just opened and ate them. Year 3. A few months ago, my good friend invited me over to make pineapple cakes. Of course I said yes. She has the most gorgeous kitchen. I’m not even exaggerating when I tell you that her kitchen looks like something out of a magazine spread. Her kitchen island is enormous and a beautiful shade of black and white granite. Everything you photograph on that kitchen counter comes out looking lovely. I could live in her kitchen. Anyhow, we followed a very popular recipe and set about making the cakes. With two people, everything went by much faster and it didn’t seem that hard at all. The only problem was, we were not happy with the recipe we found. The dough was very hard to work with and the jam consistency was far too watery and tart. We didn’t love the recipe, but with a few tweaks, we figured we could get it to work. I vowed to continue researching, but of course, never got around to it. And that takes us to the present. The process ended up taking far longer than I expected, but that is mainly because I was trying to figure out the best recipe, the best method, etc. Hopefully, with this recipe in hand, it won’t take you nearly as long to do. The pineapple jam filling is pure pineapple. Many store-bought pineapple cakes are made partly with winter melon which is a cheaper substitute and uses maltose as a thickener. I think the real pineapple filling is even better. I also did not use maltose because I know it’s not a common ingredient to locate. This jam isn’t quite as thick without the maltose, but it does hold up pretty well and tastes much fresher. I actually found two versions of the crust I liked. First, I made a crust following a recipe I found. The dough was soft and easy to work with. The problem was when I tried to stuff the dough into the square pastry molds, they immediately started to crack. Once the dough cracks, that’s how it will remain even after it is baked so you want the dough to be as smooth as possible. I baked a few this way and I really loved how the crust tasted but I hated all the imperfections. So I then tried again, adding egg yolks. The egg yolks did the trick. It kept the dough from cracking, but it does also add a slightly firmer texture to the crust. You can try the recipe both ways, with the egg yolk or without and see which you prefer. 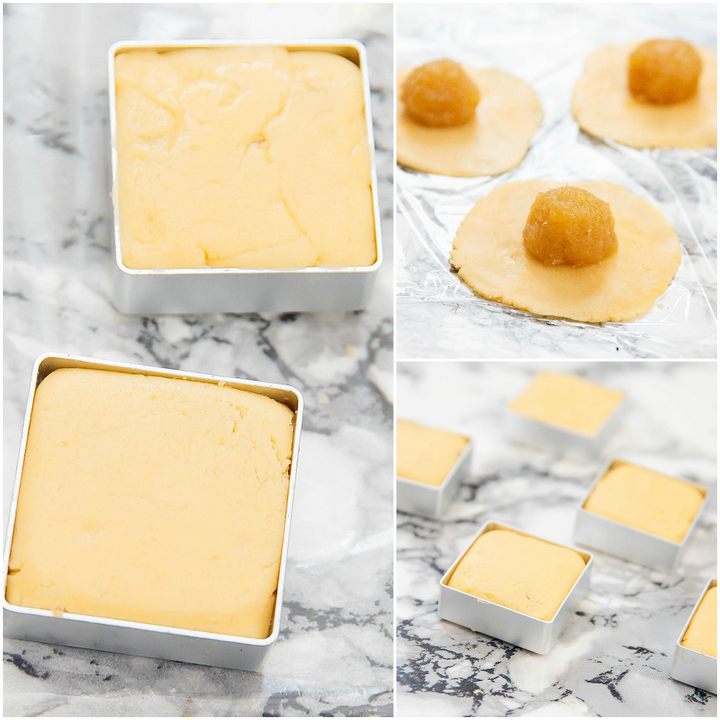 Pineapple cakes need a special square pastry mold which they are baked it. It’s quite hard to find. I finally purchased these on Amazon*. Actually, I purchased the square ones which they no longer carry, but they carry the rectangle ones which are the same size. The set of 10 was perfect. I was worried when they arrived because they seemed to be the right length and width but not enough height. 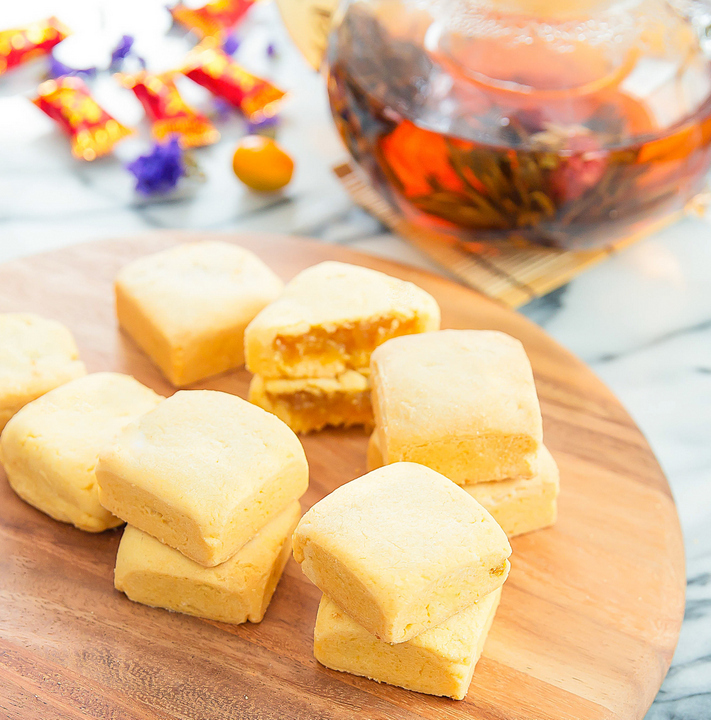 However, once they were filled and baked, they puff up a little above the molds, which made them just the right thickness as traditional pineapple cakes. 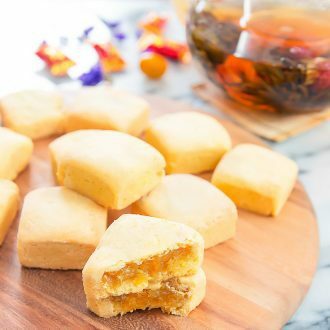 Chinese pineapple cakes (鳳梨酥, pronounced Feng Li Su) are a famous pastry in Taiwan. 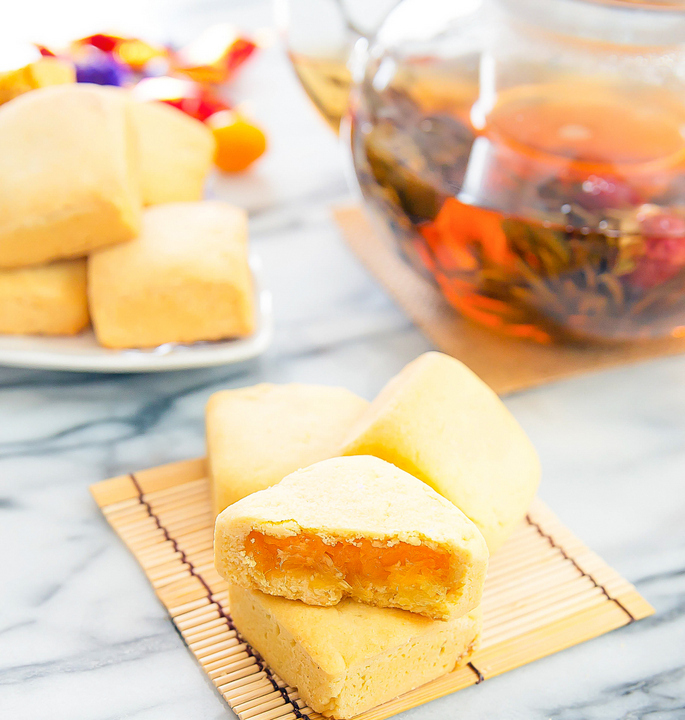 Usually square-shaped, it has a buttery, shortbread-like casing with a pineapple filling similar to a very thick jam. It is often served and gifted around Lunar New Year. In a medium, nonstick saucepan, add drained crushed pineapples. Bring to a simmer on the stove and cook, uncovered, for about 20 minutes or until most of the excess liquid evaporates and mixture thickens. Stir in sugar, corn syrup, and honey. Cook mixture at a low simmer for about 40 minutes, until it becomes quite thick, with very little liquid. Stir occasionally. You may also want to taste it a few minutes after everything is mixed together to see if the filling is sweet enough. If not, you can add a little more sugar. Stir in the flour and cook for an additional 15 minutes. Pour filling into a glass bowl, cover with plastic wrap and refrigerate for at least one hour. You can leave it for several hours or even make it the day before. You want the filling to be completely cooled when you work with it. 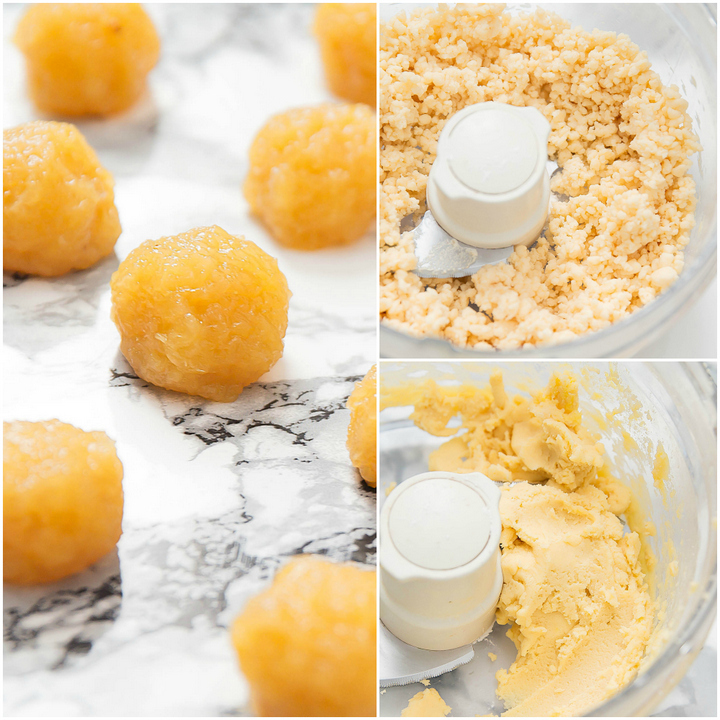 To make the pastry, add all ingredients except egg yolks into a food processor. Turn on and let it mix for about 2 minutes or until it becomes little balls of dough. See photo above; they look like dippin dots. At first the dough will turn very crumbly as your food processor breaks down the butter, but it will eventually turn soft into the little dough balls. If you want to try the recipe without egg yolks (as discussed in my notes), you can just squeeze these dough balls together to form one big ball of dough. Otherwise, add egg yolks in and pulse for about 1 minute, until smooth dough forms (shown in photo above). Scoop out 1.5 tbsp dough balls and shape between palms to form round balls. Continue until all dough is used up. Set aside. Take pineapple filling from the fridge. Scoop out 1 tbsp of filling and compress between palms. Filling will be sticky and wet to work with. Gently roll between palms to shape into balls. Make enough filling balls to match the dough balls. Lightly grease the inside of your square molds, by brushing them with oil. Take a sheet of plastic wrap and stretch over a flat surface, keeping it as smooth as possible. I found that plastic wrap really helped to make these cakes pretty. You want the plastic wrap to be smooth because your dough will have creases if your plastic wrap has creases. Take one of your dough balls and place it on top of the plastic wrap. Press down with your palm until it spreads out to a thin round. You want the round to be just big enough that it will wrap over the filling. It may take a few tries to determine the best length to stretch your To make to. The round should be thin because the pastry is supposed to be only a thin layer of crust. However, keep the middle section of your round slightly thicker and thin out more on the edges. This way, when you bunch all the edges together to seal your pastry, the bunched edges won't become too thick, which would make one side of your cake uneven. Place a pineapple filling ball in the middle of your round. Lift one side of plastic wrap and peel the round from that side. You should be able to easily peel it off and the bottom side of the round should be completely smooth. 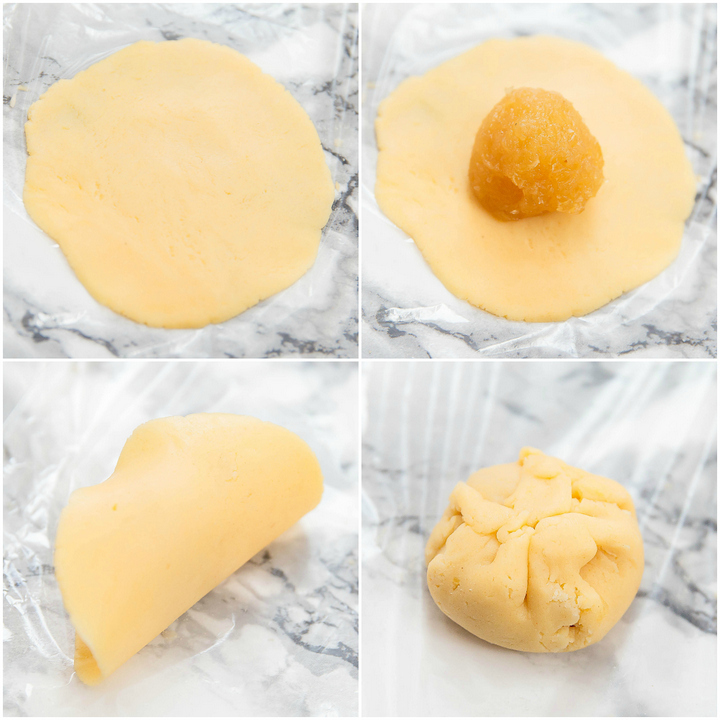 Lift round completely from plastic wrap and then cover your pineapple filling with the dough, sealing the edges on top, attempting to smooth them as much as possible. Place your square mold on top of the plastic wrap. Place your dough ball inside the square, with the bunch up ends side facing up, smooth side facing down. Carefully push and spread your ball until it spreads out completely across the square mold. It may take a few tries to get the hang of it. The dough should fit completely inside the mold. Try to smooth the surface of the dough as much as possible. Flip over. The underside of your dough should look nearly completely smooth and should fill the entire square mold. One of the photos above show both the finished smooth side and the side with the bunched edges. Place mold, with the smooth side facing up, on a baking sheet lined with silicone mats or parchment paper. Preheat your oven to 350°F. While your oven is heating up, finish making the rest of your pineapple cakes. Bake for about 25 minutes or until the tops turn a light golden brown. Remove from oven and let cool a few minutes. After about 15 minutes, gently push the cakes out the molds. 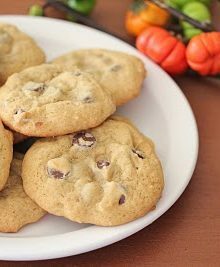 You can eat immediately or wait for them to finish cooling. Store any uneaten ones in an airtight container at room temperate. Because these have a fruit filling, do not store for too many days. I'm sorry I didn't have a chance to convert all these measurements into cups. However, if you do a google search, you should be able to find the conversions you need if you don't have a kitchen scale. These are BEAUTIFUL, Kirbie! I have tried making my own (also from a well known website) and wasn’t thrilled with the results. The exterior cracked and was dry, and the filling wasn’t as awesome as I wanted it to be. Thanks for doing all the research to find the best pineapple cakes! I will definitely try your version soon. P.S.- totally agree that Chia Te has the best ones in Taiwan! Thanks Eva! I really wish I had my hands on the Chia Te recipe! No need salt for the dough? Thank you. I LOVE pineapple cakes and have never considered making this at home. Saving this and finding a way to bake them in another shaped mold or maybe madeleine shaped pineapple cakes? Either way so excited that you found a working recipe! You can actually free form bake them as well, but their shapes just won’t be as sharp. I did a few without any molds because I only had a set of 10. They still hold their form baking without the pretty well. What about trying egg white instead of the yolk? I didn’t try that, but I don’t think that will work. The egg yolk gives the dough a little more fat, which makes it softer and easier to work with. The dough is basically supposed to be like a shortcut pastry, which is usually just butter and sometimes egg yolks, which is why I tried the egg yolk. thanks! they are one of my favorites too! I first tried pineapple cakes from you and Jinxi as food gifts (and I loved them). I like that your recipe uses pure pineapple an none of that wintermelon filler. Thanks for all of the details with the recipe as well as the link on where to get the molds. pure pineapple is so much better! I visited the grocery store for corn syrup but I have two options – light or dark corn syrup, which one does this recipe call for? I am trying to make these for a Taiwanese friend, but I ran in to hiccups with the dough. I’m hoping you could offer some insight. In my food processor (before adding the yolk) the dough clumped together…like I had a 1/4 inch layer of solid dough on the bottom. Above the solid layer, they looked like crumbs…not dippin dots. Any thoughts on why that would happen? I thought perhaps my butter became too warm, so I put the dough in the fridge for thirty minutes before continuing. It worked a little. My second issue is that the dough broke when I was trying to flatten it out, especially the edges, so when I went to wrap the filling, it was just full of cracks. I experimented with different amounts of dough and thickness and amounts of filling. Nothing worked. Any advice? Yours look so scrumptious! Thanks for the help! Hi Valerie. Sorry you are having issues with the dough. For the first issue, you want to make sure that your butter is cold when you make the dough. Like many other pastry doughs, the butter needs to be cold and solid. You don’t want it to be room temp or melty. If it’s cold, then you should be able to achieve the little crumbles of dough rather than clumped dough. With regards to your second issue- are you flattening with your hand or with a rolling pin? I found the best method was the one I stated, with the plastic wrap underneath and slowly flattening it out with your hand to prevent cracks. Also, you had mentioned that you refrigerated your dough. This may have stiffened and dried it too much which would also cause it to crack. Your dough should be quite soft and pliable once you mix in the egg yolk. It shouldn’t feel stiff or dry. So I would recommend not putting the dough in the fridge next time. If your dough still feels too stiff or dry, you can try adding another half of an egg yolk, which should soften the dough further. good luck! Hi! I’m looking forward to making these for my son’s school’s International Dinner (his class is representing Taiwan), but I need to bring a lot of them—probably at least 60—so I’d rather not spend all day molding individual cakes (and I also can’t afford to buy so many molds!). I’m wondering if you think it would work if I made one big rectangular cake that was layered with dough, filling, dough (with the filling sealed around the edges). I would bake it, cool it completely, and then cut it up into individual squares. What do you think, could that work? Unfortunately I’ve never tried to make it as one big cake, so I’m not sure how well it works. My concern is that the bottom may not cook well. Hi, Kirbie! Thanks for getting back to me. I shared your concern about the bottom crust so I consulted a Cook’s Illustrated recipe for raspberry streusel bars that instructed me to parbake the bottom crust before adding the fruit filling and top crust. So I baked the bottom crust by itself for about 15-18 minutes,, then added the mostly cooled filling and ever so carefully the top crust (that was the trickiest part! I had to pre-roll it to fit perfectly in my 9×13 pan). I then poked a few venting holes with a toothpick and baked the whole thing for about 25 more minutes. It turned out great! However, after cooling all the way, I cut it up into little squares and just about every single one cracked a bit on top. 🙁 But everybody at the party loved them anyway and ate them ALL up. Thank you so very much for this wonderful recipe!!! I look forward to trying it again as individually molded cakes. Hi Jenni. Thanks for letting me know how these turned out! I’m glad you were able to get it to work. The crust is so delicate so that would be why they would crack when cutting–I didn’t think of that earlier. You shouldn’t have cracking with the molds but I am glad everyone enjoyed them! Hi, just wondering if you could clarify the quantity of pineapple please? Is it 2 x 20 oz cans or 20oz total? Hi, I like your instructions but I was wondering if there is a chance you might upload a video tutorial on it…? I’m not too familiar with baking in general so seeing how it’s done will help alot. I’m excited to try this, ever since I tried packaged pineapple cakes from the Asian grocery. I can only get custard powder from Amazon. 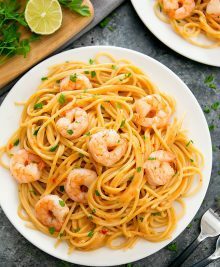 It looks like the ingredients are only “cornflour, salt, annatto, and flavoring.” Any idea on whether I can substitute cornstarch with maybe a little vanilla and a drop of yellow food color? Are these the square molds you speak of (https://www.amazon.com/gp/product/B00K6TKX7K/ref=ox_sc_act_title_2?smid=A2IRHAF1PNRPGO&psc=1) as they may be back in stock? I wasn’t sure of the height…. Also, would they last longer in the fridge and then just take them out an hour before to get to room temperature – have you ever tried this or freezing them? Your recipe is perfect! I have made them 2 times now. I end up with a little extra pineapple jam, but will save it and use it for future batches, or put it on my toast. Everyone says they taste even better than Chia Te. You have done a great job and I thank you for sharing the recipe. I hope to share your link with others. Oh wow, better than Chia Te? That’s such a wonderful compliment. So glad you like the recipe!